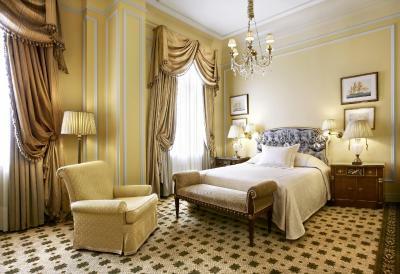 Lock in a great price for Hotel Grande Bretagne, a Luxury Collection Hotel – rated 9.2 by recent guests! This is about our 10th time here. 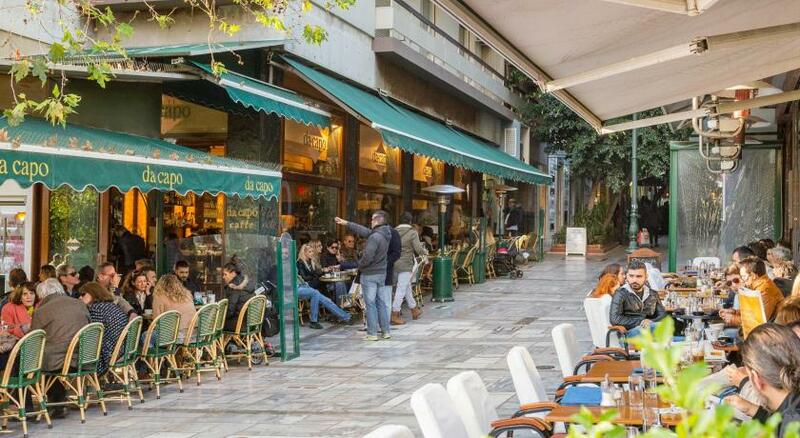 We always stay here when we visit Athens. Great view. Comfortable beds. 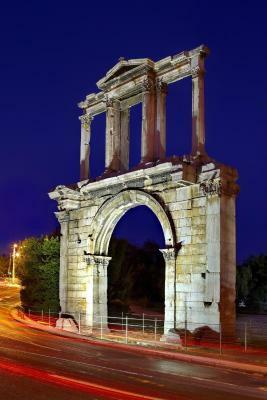 Close to most main attractions in Athens & metro. Beautiful views and rooms were nice. We were on the butler floor & the staff there was exceptional. Particularly, Panos, Vassilis & Chrissa were great. They were extremely helpful, responsive & cared about our needs & questions. All of the hotel staff were professional & friendly. The hotel is a old, but beautiful facility in a great location. One of our favorite hotels in our many travels. 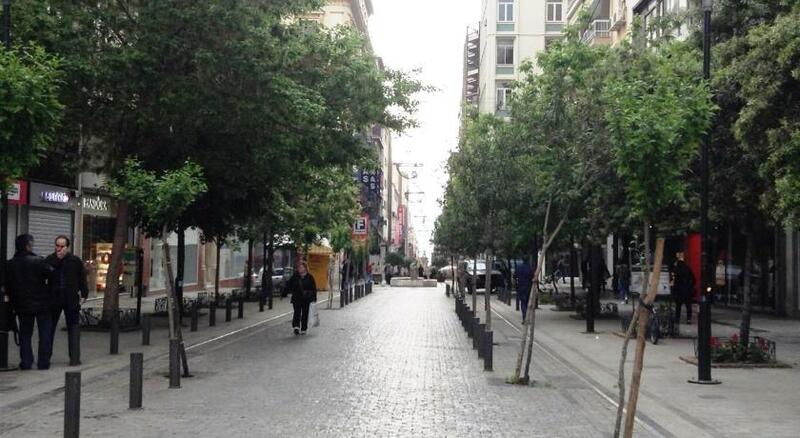 The location of the hotel is ideal. It has a beautiful decor and it is majestic. The staff is extremely helpful and the upstairs restaurant/bar is awesome. Everything. 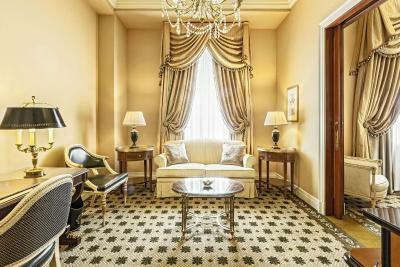 It is a magnificent 5 star hotel that everyone needs to experience once in their lifetime. 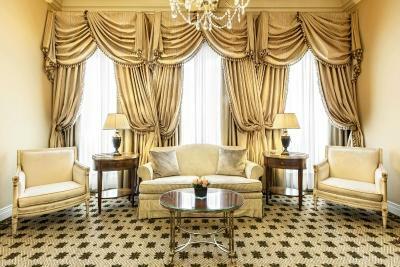 It is beautifully decorated with elegant & sophisticated decor. The roof garden restaurant was an amazing dining experience with Acropolis as its backdrop. Magical! The location is perfect. The view of the Acropolis is amazing. It’s wonderful to have a pool available inside and outside. Everything was superb but the view of Acropolis from our terrace was the icing on the cake. Staying on the 6 th floor was perfection. We had dinner in the roof top restaurant and drinks downstairs and it was a great experience. Location is very central, great views. Bed was comfortable. Room was dark in morning with curtains drawn. The people were super friendly and very accommodating. 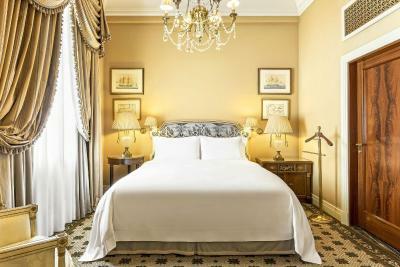 Hotel Grande Bretagne, a Luxury Collection Hotel This rating is a reflection of how the property compares to the industry standard when it comes to price, facilities and services available. It's based on a self-evaluation by the property. Use this rating to help choose your stay! 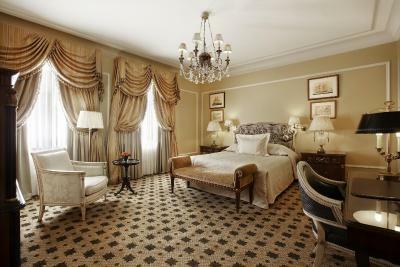 One of our top picks in Athens.With a prime location, opposite Constitution Square and the House of Parliament, the Grande Bretagne features luxurious rooms and stunning city views from its magnificent rooftop terrace. WiFi is offered in all rooms and areas. 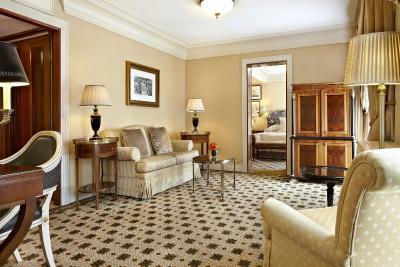 The lavish rooms are appointed with the finest furnishings. The marble bathrooms feature a vanity counter, separate bathtub, and shower. 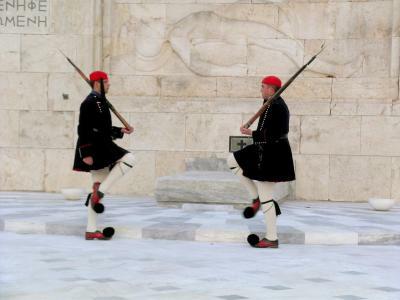 Some rooms have balconies facing the Acropolis, and the daily changing of the guard at the parliament building. 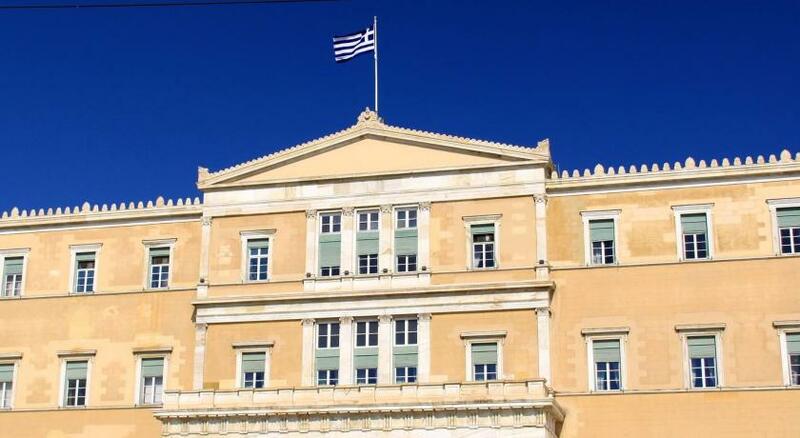 From Grande Bretagne’s Roof Garden Restaurant you can see the original Olympic Stadium as you dove into the pool; the Acropolis from your barstool; the Parthenon as you sample the finest Mediterranean cuisine. 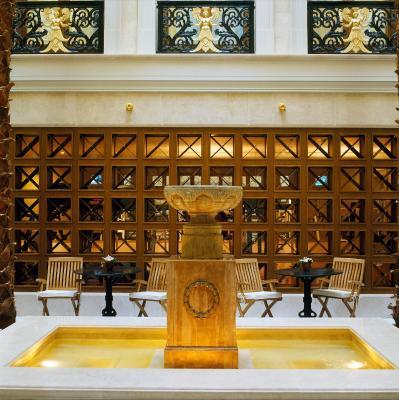 The Grande Bretagne Spa offers a thermal suite, complete with herbal bath, grotto, ice fountain, couples retreat and indoor pool. Guests can indulge in ouzo oil massages. From private dining parties at The Cellar, to VIP airport transfer, the legendary Grande Bretagne prides itself on its service. 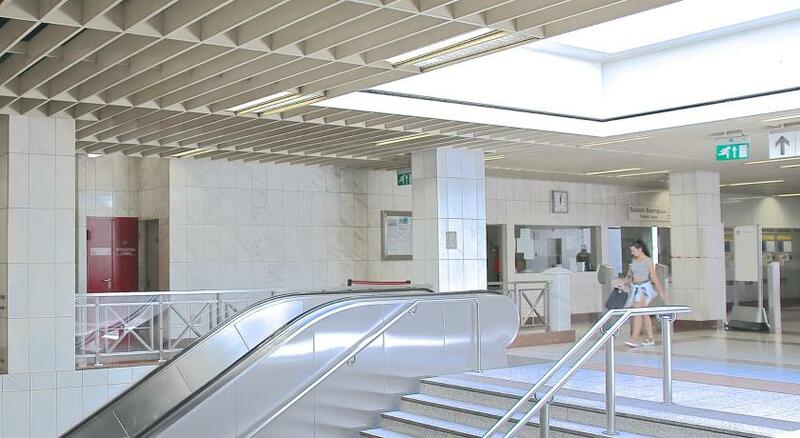 The multi-awarded 5-star hotel is walking distance of exclusive shopping areas, museums and the business district. 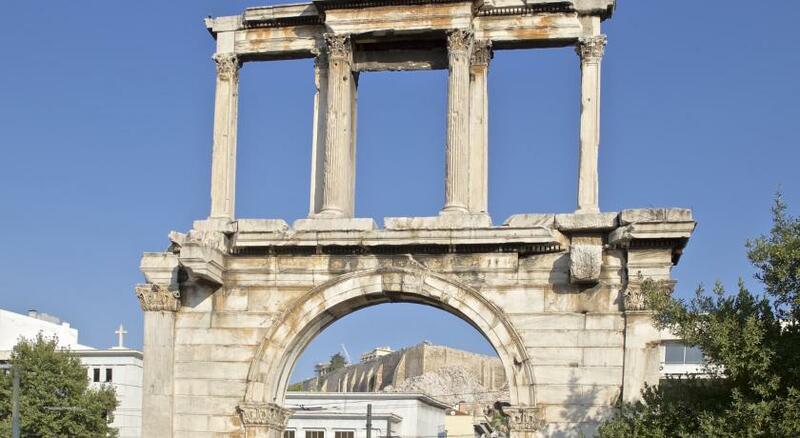 The Ancient Agora and the Acropolis are 1,950 feet away. 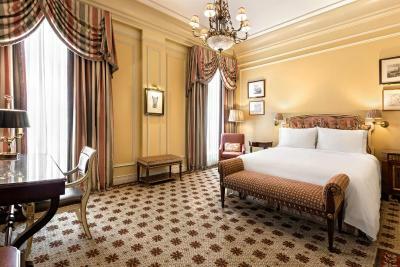 When would you like to stay at Hotel Grande Bretagne, a Luxury Collection Hotel? 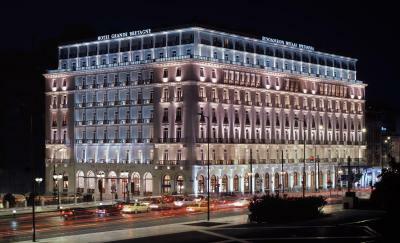 Hotel Grande Bretagne is the most historic property in the heart of Athens. 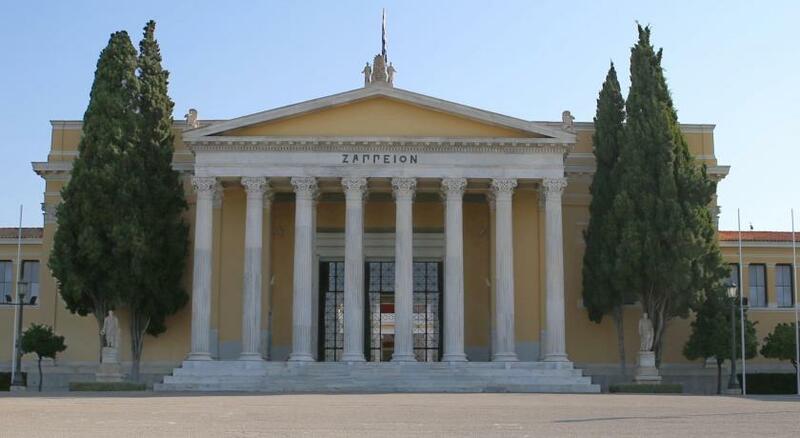 Being the 'royal box' of the city ever since 1874, this is a Living Museum in the land of the ancients. 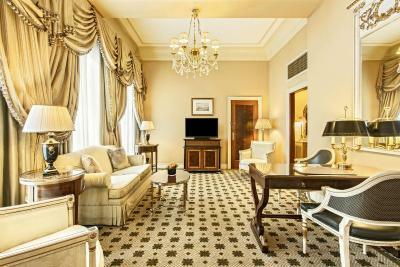 Apart from its rich history and extensive heritage, Hotel Grande Bretagne is the only hotel with a 400sq.m. 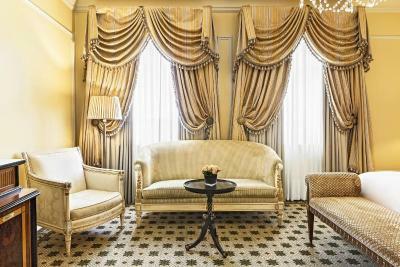 Royal Suite and awarded Spa in the city of Athens. 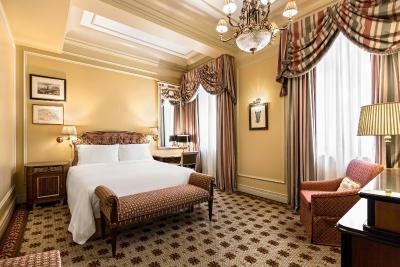 A pantheon of renowned personalities, royalty and heads of states have visited and are still visiting this landmark hotel. 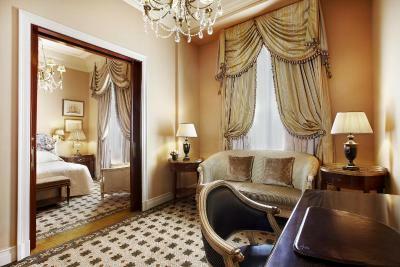 House Rules Hotel Grande Bretagne, a Luxury Collection Hotel takes special requests – add in the next step! 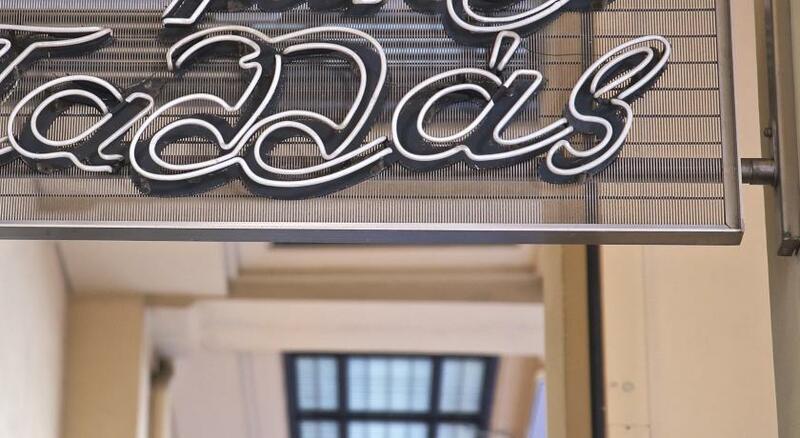 Any additional older children or adults are charged EUR 68.14 per night for extra beds. 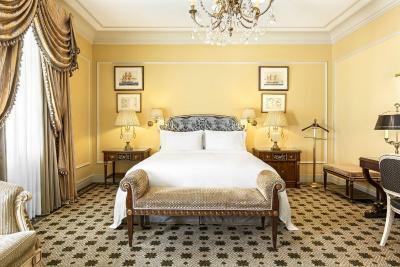 Hotel Grande Bretagne, a Luxury Collection Hotel accepts these cards and reserves the right to temporarily hold an amount prior to arrival. The hotel would kindly request that all children are supervised by an adult at all times. Children 16 years and younger are only permitted to use the indoor pool from 9am to 2pm. Please note that the outdoor pool is open from May to October, depending on weather conditions. 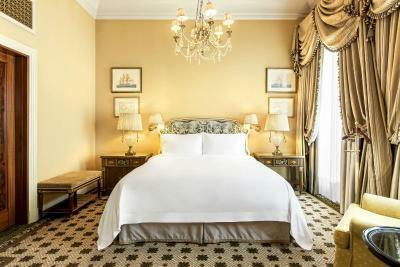 The Hotel Grande Bretagne is a non-smoking Hotel therefore smoking is not allowed in the rooms, bars, restaurants or any public areas of the property. Guests are welcome to check-in at 2pm. Check-out is at noon, though the hotel is pleased to accommodate late check-outs upon request. In the case of a late check-out before 6pm, an additional half day rate will apply. 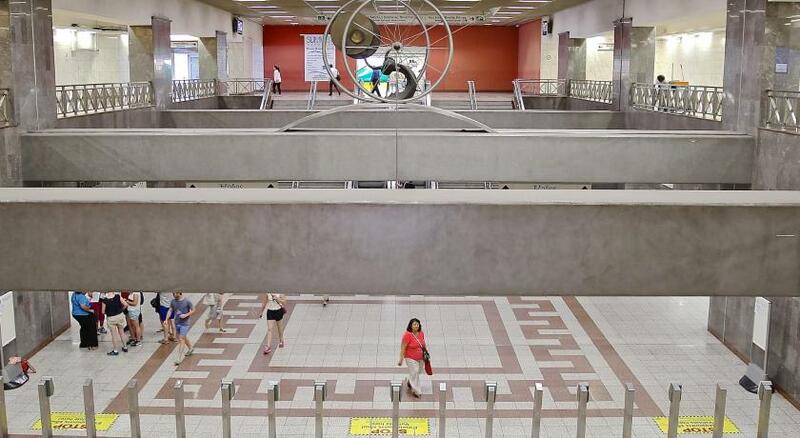 For check-outs after 6pm, a full day rate will apply. 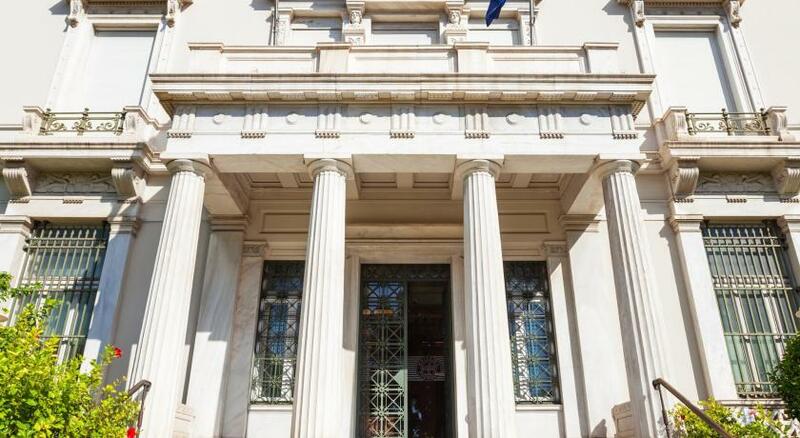 Hotel Grande Bretagne participates in the Greek Breakfast Initiative by the Hellenic Chamber of Hotels. Please note that free WiFi is available in all rooms with a limit on data usage. 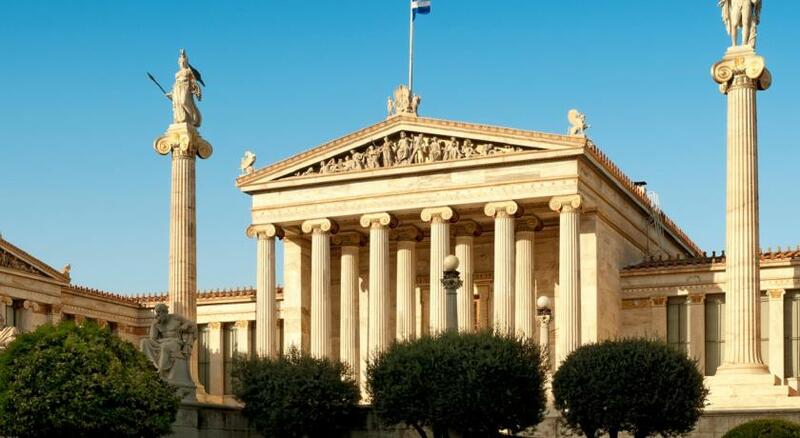 Great hotel just across the Parliament and Syntagma Square, within waking distance to Acropolis, Plaka and main attractions. The GB Roof Garden restaurant offers amazingly delicious food whilst enjoying great views of the city and Acropolis. Super helpful staff always with a smile on their face. Highly recommended! They upgraded me which originally I was delighted about but I did pay a lot more for it than I was expecting. Location was perfect, rooftop restaurant was excellent. Staff helped with an injury. Immediate service. The size of the room was too small for a 5 star hotel and there was no shower in the bathroom, just a bathtub. 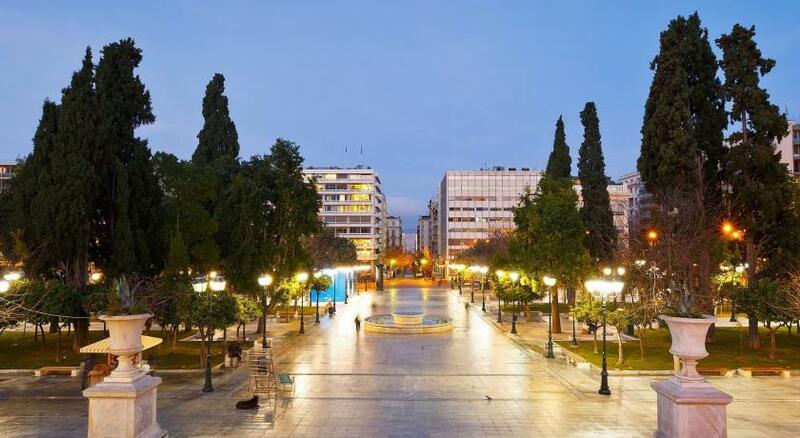 A jewel in the heart of Athens. The location is excellent . The interior and the facilities are unmatched . 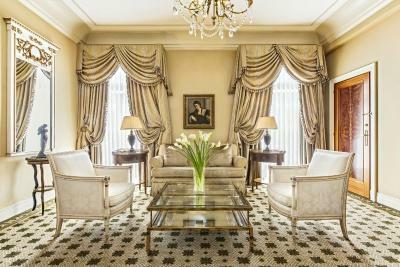 The environment and atmosphere meet all the expectations of a luxury hotel. this is not the first time to have stayed in this hotel and the reception always answered my request of a late checkout time. They were updating their key system so our key kept ruining and we had to change it like 3 times in a one day stay. the room was very small for the price.Also because i booked through booking.com they were unhelpful in changing the room. The breakfast view was exceptional. Breakfast was excellent - the view from the Roof Restaurant is amazing,; the Eggs Benedict superb; the pastries fresh and tasty. The mattress was really comfortable and the shower excellent. 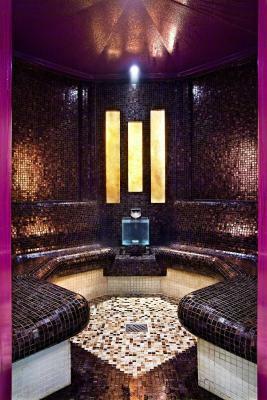 The Spa is also outstanding! Room 1 : Sewage odour in the evening Room 2: after the change to smaller room no hot water or internet when we slept in the evening. Room 3: Suite ok but it reminded Second World War relics. The room was dirty and the curtains have probably stains from 50 years ago as they have never been cleaned. Breakfast so poor that Booking is negligent for calling it fabulous. The Al Carte was excellent. Location wise poor as the hotel facilities are almost non existent due to outsiders using them most of the time including the meter for the taxi which we had to walk to get a taxi other than the check out date when they got paid. 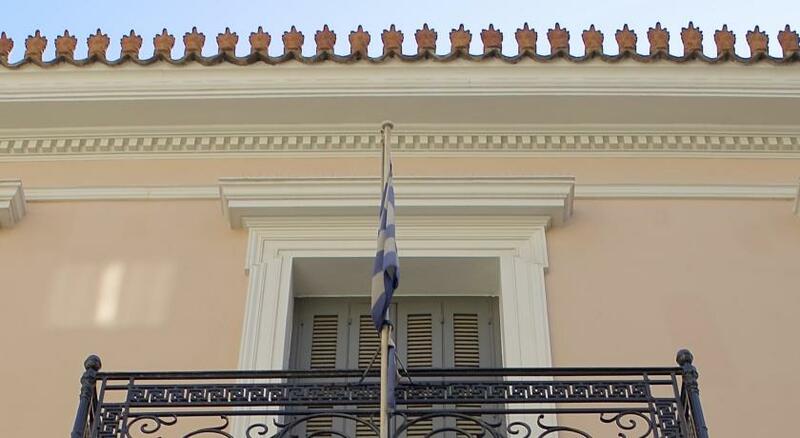 This is the ultimate hotel luxury experience in Greece.The hotel is considered historic the furniture and the decor is classical and stylish.The breakfast on the upper floor has the best view you can expect in Athens but a superior quality although not the extravagant buffet but the absolute authentic and quality of food one would expect..The staff is super courteous and helpful.